I let my grandchildren choose their birthday cake theme. At first my granddaughter wanted a ballerina cake because she had just started ballet class. Then she changed her mind as 4 year old’s often do. 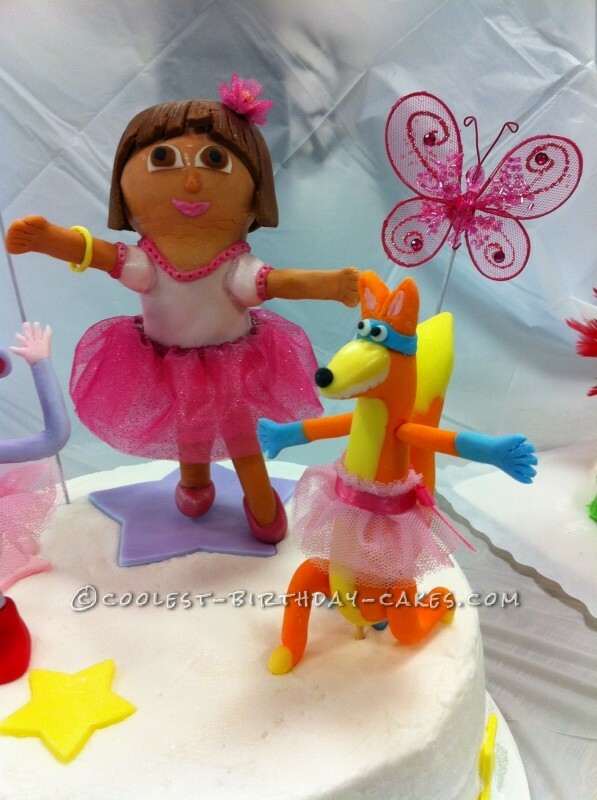 She decided on Dora the Explorer…so I made Dora a ballerina. I also made Boots and Swiper ballerinas. The “boys” were none too happy about that but my granddaughter thought it was funny! I start about 2 weeks ahead of the party with baking and freezing cakes, making icing and fondant. I especially do that for this granddaughter because she and her brother celebrate their birthdays together. The double party is a killer for the cake maker…AKA Mimi…me! My daughter tells me not to get carried away but I can’t help myself. I started with a 9” double layer cake. I’m not very good at smoothing decorator icing but I found a trick online. I get it as smooth as I can then let it dry until it is dry enough not to stick to a paper towel. I place a paper towel with no design (I think it is Viva brand.) on the cake and use a fondant smoother to smooth the icing. It’s not perfect but good enough for me. 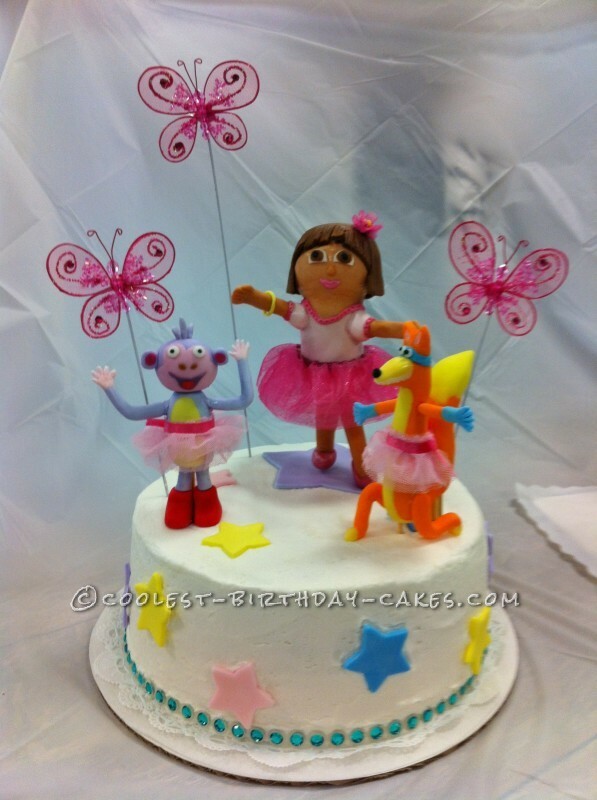 Dora, Boots and Swiper are made of fondant as are the stars. Dora has rice krispie treat for the base of her body and head. For her legs and arms I covered ¼” dowel rods with fondant. I sharpen one end of the dowel with a pencil sharpener so I can stick it easily into the rice krispie treat body. I had a dowel going from her head to the bottom of the cake. She lived on a dowel rod in a lidded thermal glass (in the straw hole) for several days. For small parts that have to be attached I use toothpicks or bamboo skewers. Swiper’s tail has a dowel rod holding it in place because it was very heavy. He also has a dowel through his body into the cake. Boots is also anchored to the cake with dowels in his legs. I added the butterflies and rhinestone trim for a little bling. 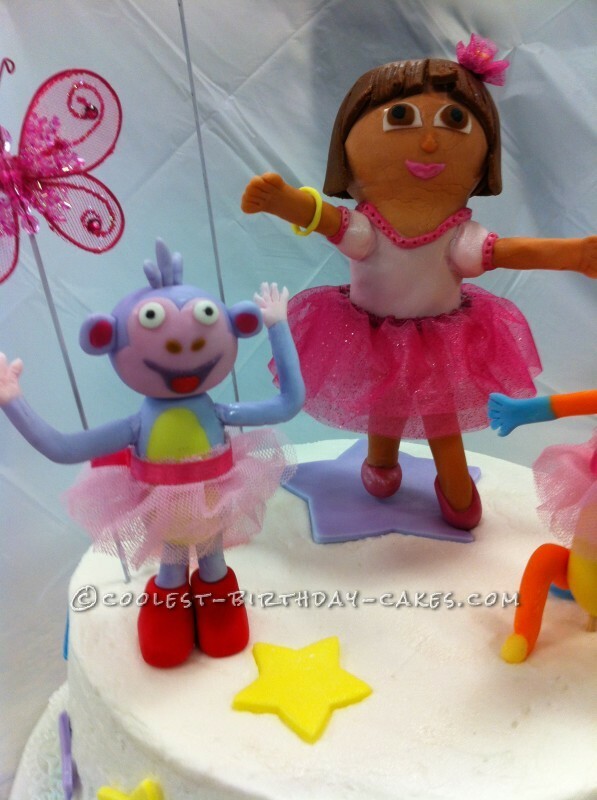 Dora looks a lot like Doc McStuffins that I made for her last year. There was a “cake-tastrophy” last year both before and on the way to the party (3 hours away) so I didn’t put the figures on the cake until we arrived at the party this year. The cakes I make for my grandchildren are a labor of love!